This 3 Foot Cable Comes with Connectorized Ready-made Ends and Features Black or White UV Resistant PVC Jacket over Two layers of Bonded Foil and 77% Braid, Bonded Foam Dialectric with a Copper Clad Steel Center Conductor. 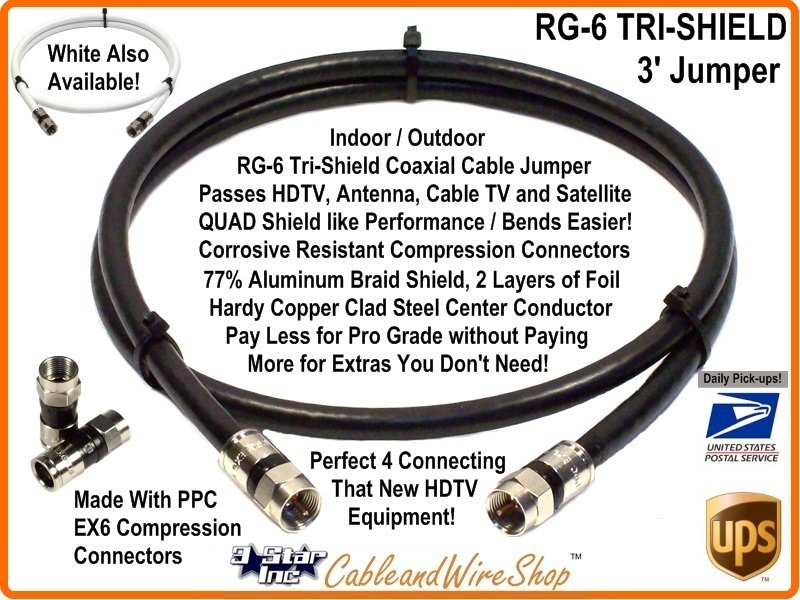 You can use this jumper to connect that new Splitter HDTV, Antenna, Outlet Jack, and Even Satellite Dish! Use transition Connector/Adapters for conversion to RCA and BNC Connections with Baseband, RF and Video! Perfect for HDTV, DTV, Cable TV, Master Antenna and Satellite Master antenna Applications with 2.2 GHz Bandwidth. This Cable comes in Black or White and is UV Resistant for Installation Inside and Outside of your Home or Office. Fast shipper & great price! Thank You!